Umbrellas endure challenges in all kinds of weather—harsh winds, driving rain, and sometimes the rays of unrelenting sun. When their ribs break and the fabric tears, they are abandoned on city pavements. Alone in the womb of the night, their remains take on new life. The sixteen umbrellas in this collection, freed from their assigned role, have re-emerged as flowers, butterflies, and moths, revealing beauty inherent in the discarded object, and deepening our awareness of the ever changing face of life. Rain nourishes, purifies, and renews. Water is never passive; it is living and spiritual matter. In religious rites around the globe, it is used to elevate awareness and as a conduit between this world and the Other. In Jewish tradition, this conduit is a mikvah—a body of water collected from rainfall. Every month a woman is obligated to immerse herself in a rain water to once again become a partner with God and her husband in the act of creation. As she emerges from the water, she is born anew, ready to conceive once more. Water from rain is also integral to conversions as well as a key ingredient in preparing the deceased for burial, by washing the body with it. In Christian doctrine, the gateway is baptism—the door to all other sacraments. Baptism is defined as the sacrament of regeneration by water in the word. An initiate is submerged in water and is born again into the Church. Likewise in India, Hindus bathe in the River Ganges—known as Mother Ganges—to cleanse their soul. Hindus hope to die there, thus be liberated from the cycle of earthly life. Under the great canopy that holds the moon and stars lies a planet inhabited with birds and beasts. Looking at the heavens, we marvel as one star vanishes and another appears in a dazzling dance of flickering lights. Death is always near; what’s important is not that some lights will fade away, but how each kept the sky aflame. Rain falls, tapping the earth on its shoulders. Like the steady beats of an alarm clock, it entreats humanity to face life boldly, reminding the living not to despair in the presence of loss, for renewal will come after the rain. 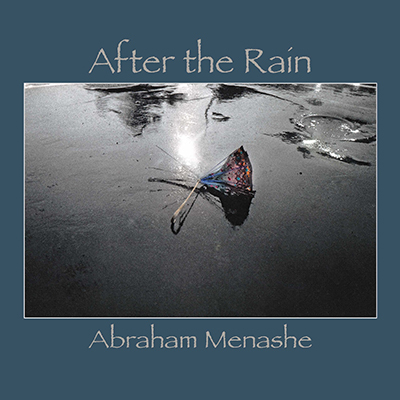 After The Rain, by Abraham Menashe, available from iTunes.